In this blog, I’m going do something I don’t often do: use personal patient testimony to illustrate a point. Today, I took my teenage son to a new ear, nose, and throat (ENT) doctor. My son’s ENT history was interesting to the doctor. Reliving the story today was poignant. As an infant, my son suffered from apnea, failure to grow, and an enlarged heart. At twelve months of age, he still could not stand. We stayed with him whenever he slept because he would stop breathing and turn blue. As a young mom, I felt powerless and had little wisdom about how to navigate medical systems. One day when I insisted that my baby needed an ENT, I was told, “No ENT would see you. He does not need a specialist.” I still remember looking through my tears at him sitting at his desk. Something changed in me. I went home and called a pediatric ENT doctor who had seen my daughter two years earlier when she lost her hearing. It was a busy university hospital, but at my word, she fit my son in the next day. The doctor knew immediately what was wrong with my baby and promptly admitted him to the hospital for surgery. That night I watched the monitors as his oxygen saturation levels dipped to the 50’s. That blessed doctor operated on my son early the next morning. He had an adenoid tumor that blocked his airway 98%. Every symptom had pointed to that fact. I stayed in his hospital room with him for a week while his oxygen saturation levels improved daily. That lady ENT saved my son’s life and never charged me a dime. The hospital wrote off the entire procedure. Two things stay with me: a deep respect for doctors who care for patients and equal disgust for those who work in medicine and ignore patient testimony. If my son had died, we would have been told it was due to SIDS (sudden infant death syndrome). However, the real cause would have been a lack of attention to patient testimony – in this case by proxy of parent. Can we call that LAPT? 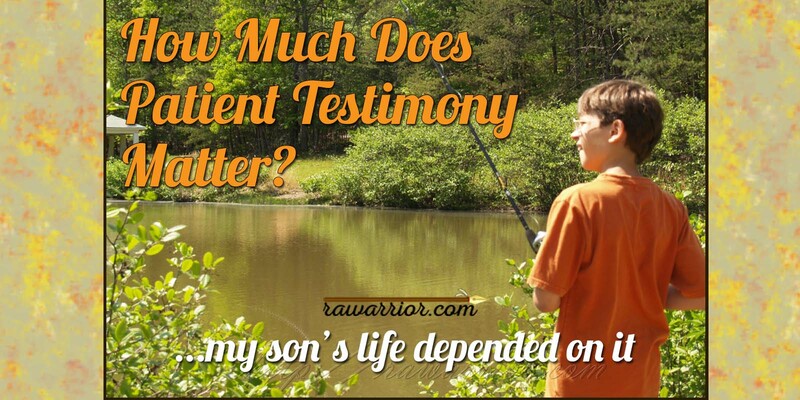 Unfortunately, there are many more examples of discounting patient testimony in my own family. In fact, there are examples with greater consequences than in this example. Rheumatoid Arthritis patients have also shared stories on this blog that illustrate a lack of credence to patient testimony. So what does all that prove? Anecdotal evidence proves nothing. 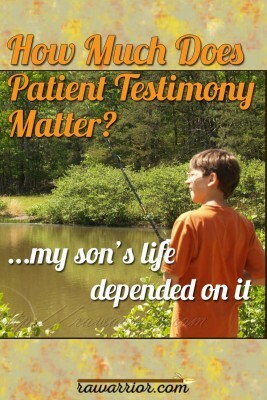 My only point is that patient testimony is of inestimable value. It is ignored at the peril of all. My son? Today I bought him a new Boy Scout uniform – adult sized. How much is the patient’s testimony taken into account by medical researchers, doctors, or government safety regulators? Would Relying on Patient Generated Data Make a Difference? ← What if Rheumatoid Arthritis Patients Wrote a Dear Doctor Letter? I have never been wrong when I’ve disagreed with a GP…EVER! My Rheumy tells me to keep those GPs honest! Hmmm. I think we can say the same thing. I was always proven right. Never thought of it that way. Is that a good thing? my doctor also neglects my symptoms..
bt i m not worrying ,rather i m telling him my probs which makes me feels sick…….n demanding a solution…..which i think even he doesnt have….. Morning Kelly: I like this post a lot. Good for you for going with your gut instinct and pulling your own rabbit out of a hat to save your son. Like the use of the word testimony. I think of it in the legal sense and would sign or say any oath they wanted that what I’m saying is true. Yesterday I had to make the dreaded ER visit for pain. I was out of my mind with it, an abcess (that I’m on Amoxicillin for) my knotted muscles and my RA trying to flare through my combo of meds. While the nurse was the “I’d be so much tougher than you” type and her sister has really bad RA, I lucked out on the doc (and didn’t smack the nurse ’cause I was too tired to lift my arm :-X ). He was older, listened to what has happened to me in the last several months and provided some much needed relief. Got two infusions of morphine/valium, as he said, to try to break the cycle and get my other pain and muscle meds working again. I had about 6 hours of relief and now will get back on the muscle relaxers again to try to keep up with what the Valium started. He listened, he didn’t judge, he acted promptly and I laid there and bawled, just because he believed me. Question for anyone who reads this: I’ve been on Humira/Arava since last Sept. I’ve been so sick lately it seems like I’m getting weird reactions to my last 2 injections. While I’m always a little weirded out for the first couple days after my shot, I’m starting to get really sick from them. Burning skin, like I was dipped in acid, more pain than before the shot, weak and dizzy, stomach pain, also a large blood blister on my gum and an abscess that I’m not sure is from a tooth. Has anyone else gone through something like this? Maybe I’m just truly worn out. It just seems so late for side effects to show up. Will be calling Mayo, but wanted to know if it’s happened to anyone else. Thanks for sharing if you have any experience with it. Nanc, So glad you got the right help. Are you better now? Good for you Kelly for listening to your mother’s instinct and doing the right thing. I realized just yesterday that when something is outside of the realm of a doctor’s specialty, they tend not to really hear what you’re saying. When my twins were babies, Alana had several episodes where she seemed to stop breathing for a minute and her lips would turn blue. We made several trips to the ER and every time her O2 saturation was fine. When calling to make the 4th appointment for this issue at the pediatrician’s office, I asked for the doctor that was my husband’s pediatrician when he was a child. As soon as I described what was going on with Alana, he said “it’s reflux”. I didn’t understand it, but when we started giving her Zantac, it stopped happening. After an experience 2 years later with a stomach virus, we learned that she was having vaso-vagal reactions to the reflux in her esophagus. Sorry to have gone on and on, but after that experience yesterday, your post really struck a chord with me! Wonderful post, as usual! Wow, how appropriate. I just came back from my new rheumy’s appointment. How fun! I told him all my symptoms, how much pain I was in, how I just can’t go on like this anymore. How my thumbs are just constantly hurting, how I wake up in the middle of the night in pain because I “moved” and how every time after sitting at my desk for 30 minutes I can hardly walk. I don’t exercise anymore, I don’t do anything but go to work, go home and sit on the couch the rest of the night. He listened, digested the information and then told me that I don’t have RA and that all the symptoms point to osteoarthritis, but we’ll take some xrays to compare to last years and see if anything turns up, maybe I’ll get a letter from him in the mail regarding the results. But all my labs are normal (I’m on Humira, methotrexate) so there’s nothing wrong with me. He won’t even give me better pain meds because….he doesn’t know what I have. I was and still am in shock and now very, very angry. Basically I’ve been seeing him for the past 6 months and “IT” just keeps getting worse and worse and worse. I can barely hold a pen or type! This is my third RA doctor….my first I didn’t feel was aggressive enough, the second moved and now him. What do you do? Honestly? I don’t know if my insurance will let me switch and would you switch to someone in the same group and be labeled as the troublemaker? Go back to the non-aggressive doctor? Hope that it’s not RA and every doctor I’ve seen has misdiagnosed me? He’s taken me off the Humira, I don’t know why he’s keeping me on the methotrexate if he truly believes that I don’t have RA. Lynn, I wish I could say I had answers to this. It seems like many of us struggle with similar issues. You are the 5th person to tell me that story in the last few weeks. You know the labs can be “improved” by the treatments, right? Some say that after diagnosis & treatment, the Rf test is really not a meaningful help. Look at this post & the comments – one is by a dr. If you decide you cannot trust this dr, you might have to find another one. I know that is hard. Thanks Kelly! I did read that information earlier, and thought that perhaps the RA doctor would take into account my symtoms and not my labs. My test results did come back, positive for RA and osteoarthritis and he actually called me with the results. I guess I’m just venting now because then he sent me all the brochures for RA meds and asked me to pick out which one I wanted to try. When I decided on one, I left a message for him and asked what he thought. Course, his was response was “I gave you the brochures so that you could decide on what drug you want to take next” so basically he’s disengaged from my treatment plan? I think it’s time to move on to a new and hopefully improved RA doctor. I am very sorry that you had to go through that with your child. Doctors do not always listen to young mothers as they think we would just be over reacting. I had the same issues with my son and seizures. He is not a healthly happy 26 year old. To young mothers out there: Make the the doctor listen to you. You are the voice of your child. You know your child better than anyone! My DH had 3 conditions that were ignored by his doctor. I paid attention to his symptoms and each time, I was right about what was going on. I just took listening to him, asking questions, and then putting it together in the most logical answer (he has celiac disease, dermatitis herpitiformis–a kind of celiac disease of the skin w/ a rash, and thin membrane disease (kidney). It wasn’t hard but it took time to listen to him and ask the right questions. Maybe that’s the problem, Kelly–not wanting to listen and not asking the right questions. I’ve almost given up on doctors; they are a necessary evil. I hate to malign them like that but I really believe about 85% of them need to be in another profession. Kelly, I am hoping and waiting for the day when you can write a book on all that you have experienced and have learned through all the tough times in your life –and in the lives of your loved ones, and our loved ones! We know only too well how often doctors do not listen to patients (or their parents or kin) when symptoms etc are described. I hope that one day our children and our grandchildren, and their children, will not ever have to go through what you and so many of your Warriors have gone through. If you ever get to start a book, we will help you in as many ways as we can!! In the meantime, one issue at a time…..Thank you for sharing and for letting the rest of us learn so much from you and from each other!! Hugs!!! I’ve been through this many, many times. I’ve had really strange, sometimes rare medical problems since I was a very small child. I’ve been patronized, dismissed, told it was all in my head, misdiagnosed, and in some cases not diagnosed at all. I’ve had times where I felt so humiliated and hopeless I didn’t know what to do next. I’ve had some really awful doctors, and some really good ones. The good ones LISTENED, took me at my word, and didn’t give up on mope when they couldn’t figure things out. In my mind, patient testimony is the single most important tool a doctor has to be able to accurately diagnose and treat the patient. Without it, it’s very difficult to even know what tests to order. I’m a nurse, and I can tell you the vast majority of patients know when something’s not right. We know our bodies better than anyone else, and we know what is/isn’t normal for us. The issue is twofold. 1) As patients we need to be as detailed as possible when talking our doctors and telling them our symptoms and history, and advocate for ourselves when we feel we’re not being heard 2) Our doctors need to listen carefully to what we’re saying, take us at our word, and not give up on us when they’ve ruled out the common diseases, and be willing to refer us elsewhere if they can’t figure it out, It’s been a long hard road, but I’m blessed to have good doctors now, who listen and take me seriously. I thank God for my stubborn streak that wouldn’t let me give up, and wouldn’t let me just sit back and take it when I was ignored or mistreated by doctors!